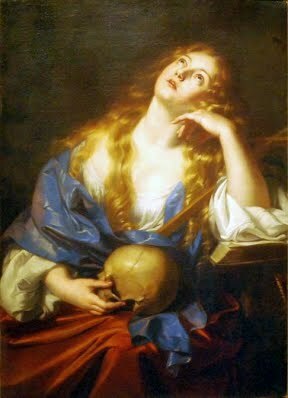 July 22 - Saint Mary Magdalene - Feast - My Catholic Life! “Cherchez la femme “ is a French phrase meaning “Look for the woman.” It is used as a convenient shortcut in movie or literary criticism to attempt to discover what is driving a plot, especially in a detective story. Why did the man risk his life? Cherchez la femme? Who had a motive to lie? Cherchez la femme? Where is the treasure buried? Cherchez la femme? It’s a cliché, of course, but even clichés often convey some truth. Look for the women in the the gospels, and you will not be disappointed. Search for one woman in particular, Mary Magdalene, and you will find yourself at all the most important events: the passion, the crucifixion, the burial of Jesus and, most incredibly, in a garden moments after a huge stone is rolled away from a tomb, opening a space for Jesus to step forth into a new world. Saint Mary Magdalene is present at key moments, says key things, and is a key witness. She opens the door to gospel scenes that would otherwise remain hidden from view. Saint Mary Magdalene was among that troop of women gathered on the rim of the circle of twelve Apostles following Jesus. These were probably women of means, who “provided for” Jesus and the apostles “out of their resources” (Lk 8:3). When these women are named, Mary Magdalene is always named first, similar to Saint Peter’s position in the listing of the Apostles. Mary Magdalene is named many more times in the Gospels than most of the Apostles themselves, signaling her importance. The Gospel of Luke relates that seven demons were driven from her (Lk. 8: 2). But there is debate over whether Mary Magdalene is the sinful woman who anoints Christ’s feet, or if she is Mary of Bethany, the sister of Martha and Lazarus, or neither woman. Building on the presumption that the sinful woman was Mary Magdalene, medieval traditions wrongly described her as a repentant prostitute. Artistic depictions almost universally show her as sultry, forlorn, and repentant. Despite the dubious connection between Mary Magdalene and prostitution, this association continues today and will likely take centuries to purify. A “combined Mary” understanding rolls all three of the above Marys into the one person of Mary Magdalene. Yet Mary was an extremely common Jewish name so it requires careful attention to the text to sift which Mary is doing what in the New Testament. Magdala was a town on the Sea of Galilee. So when Mary from Magdala is referenced, her town is adjoined to her name to distinguish her from the other Marys. An old Christian tradition justly refers to Mary Magdalene as the “Apostle to the Apostles.” The resurrected Christ appeared to her first, before all others. She is the proto witness. Mary and other women go to the tomb of Jesus to anoint His body. They see the stone rolled away and enter. The body is not there. An angel tells them to be not afraid, “But go, tell his disciples and Peter” (Mk 16:7 & Jn 20:1-2), so she dutifully fulfils his angelic orders. It is a woman, then, who tells the men, who carries the news of all news to everyone else. The men come running and verify her account. The tomb is empty. As usual, Mary respectfully remains along the rim. She weeps outside the tomb while Peter and John are inside. Time passes as they try to absorb what this all means until, finally, the “disciples returned to their homes” (Jn 20:10). But Mary does not go home. And then it happens. Mary is alone again, crying. She just can’t believe it. She has to take another look. So she bends her body to peer into the empty tomb once again. When she straightens up, she notices a man standing just behind her. She thinks he is a gardener. A short, awkward conversation follows and then comes to an abrupt end. “Mary!” “Rabbi!” (Jn 20: 16). The meaning of a name in the mouth of God! A name is said and a new life begins! At Baptism. At Confirmation. At religious vows. May we all hear the voice of the risen Christ speak our name, directly to us, just as Mary Magdalene did, when we hopefully walk for the first time in the garden of paradise: “Ashley!” ”Susan!” “Tom!” “Marty!” “Quinn!” “Juliette!”…and on and on and on until the end of time. Saint Mary Magdalene, assist all who seek your intercession to be humble followers of Christ, doing, from the margins, what is necessary to carry forward the ministry of Christ’s Church, quietly accomplishing God’s will without recognition except for its eternal reward. Or the earlier life of Mary Magdalen we know only that she was “a woman who was a sinner.” From the depth of her degradation she raised her eyes to Jesus with sorrow, hope, and love. All covered with shame, she came In where Jesus was at meat, and knelt behind him. She said not a word, but bathed His feet with her tears, wiped them with the hair of her head, kissed them in humility, and at their touch her sins and her stain were gone. Then she poured on them the costly unguent prepared for far other uses; and His own divine lips rolled away her reproach, spoke her absolution, and bade her go in peace. Thenceforward she ministered to Jesus, sat at His feet, and heard His words. She was one of the family “whom Jesus so loved” that He raised her brother Lazarus from the dead. Once again, on the eve of His Passion, she brought the precious ointment, and, now purified and beloved, poured it on His head, and the whole house of God is still filled with the fragrance of her anointing. She stood with Our Lady and St. John at the foot of the cross, the representative of the many who have had much forgiven. To her first, after His blessed Mother, and through her to His apostles, Our Lord gave the certainty of His resurrection; and to her first He made Himself known, calling her by her name, because she was His. When the faithful were scattered by persecution the family of Bethany found refuge in Provence. The cave in which St. Mary lived for thirty years is still seen, and the chapel on the mountaintop, in which she was caught up daily, like St. Paul, to “visions and revelations of the Lord.” When her end drew near she was borne to a spot still marked by a “sacred pillar,” where the holy Bishop Maximin awaited her; and when she had received her Lord, she peacefully fell asleep in death.